Children ages 1 to 2 years old. Our main goal is to make your baby feel secure and loved with us. We also want to be certain that we provide opportunities and experiences that will promote development of language and motor skills. Learning is hands-on and will give the children free choices to explore by touching, seeing, hearing, and doing. Your child will enjoy singing and dancing, listening to music, finger plays, story time, puzzles, manipulative activities and toys for fine motor development, playing on the playground, and so much more. We read books to them and also they can “read” picture books that are not easily destroyable. In all the activities teacher is right there with them, helping, showing how to, alleviating child’s frustrations, protecting them from each other. 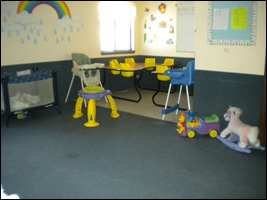 We will get to know your child as quickly as possible to insure he/she is comfortable in this new environment. Children who are on a bottle will be given the chance to take their bottle while sitting at a table. The babies moving up from the younger class are usually weaned from a bottle by move-up time, but we want to encourage you to bring your child to our class just as they are, let’s transition together. All meals are provided by the center and the children eat as a group. Diaper checks are done every 2 hours. Children over 12 months will be sleeping on a rest mat. A blanket for cover and the rest mats are provided by the center. We try to go strolling outside or play on the playground every day. Please send your child to school with shoes every day. Each day we send home a report which includes information on nap times, diaper changes, how your child ate lunch and snacks, general mood, and notes about special activities that day. Diapers – plan on 8 – 9 per day. Two complete changes of clothes. Bibs are provided. Anything you bring from home, such as extra clothes, bibs, blankets, etc., should have your child’s first initial and last name written on it in permanent marker. Sore or discharging eyes, ears or profuse nasal discharge. These symptoms are most frequently the result of viral infections and are easily transmitted in young infants. When visiting your child during the day, remember to consider the other children who may be asleep or may not know you. Children often cry when strangers enter the room, sometimes they continue to cry until the stranger has left. Remember, siblings may be considered strangers too, from a young child’s perspective. Please be considerate and pick your Dolphin child up before you pick up older siblings. If the children do seem to be upset by your visit, it may work out better for you and your child to visit together away from the room, then when you need to get back to work, bring your child back to the classroom. Thank you for the opportunity to be a part of your family life. The next few years are very important in the development of young children. Let’s work as a team! Your input and suggestions are vital to us as we get to know and work with your child. To see what our daily schedule of activities looks like, click here. Copyright © 2003-2019 Noah's Ark Learning Center, LLC. All rights reserved.